**9/8/16 I drew a name out of the bowl the winner is Pepper Medley. Thank you so much to Sipping Iced Tea for participating in this giveaway. Please support this small business. I was recently spending time perusing Etsy when I ran across the cutest little shop. Sipping Iced Tea is a shop filled with handmade and hand painted items that I love and you will too. The pillow you see above is all mine! I ordered this one from the shop owner, Kay. It's so cute that it makes me smile and right now I'm channeling cool winds and pumpkin spice. and she's generously agreed to give one to you! First, please check out some of the adorable offerings on her Etsy site. where it lands next year at our new house. OK, this one's for one of you as a gift from Sipping Iced Tea. Be sure and visit Kay's Etsy site and support a small American made business. Use this code to save 10% if you'd like to order FALLGIVEAWAY. Drawing will be held Friday, September 2, 2016. What a fun pillow! Thanks for a really sweet giveaway! I like the white on white pumpkin pillow...but they are all beautiful! Pretty ones for the holidays too! Thanks so much! Hugs! What a talent Sipping Iced Tea is! A truly fabulous find. I will definitely visit her shop. I love supporting. The creative people. They are adorable. Definitely going to visit her shop. What a fun pillow! I'm becoming more and more addicted to pillows every day. :) Love this one for fall! Darling pillow! Perfect for Fall. Thanks for the chance to win the cute pillow. How cute! This would be a great fall decoration. Oh how I'm smiling, that pillow is precious and I need one to add to my pumpkin decor. What a darling etsy shop!! Hope the week is off to a great start and treats you with kindness!! This is so cute!! Even with all my cleaning out I think I could find room for something like this. Love it! What a cute pillow! She has so many cute things in her shop! Oh this is so stinking cute! And I love the name of her shop! The pillows are so cute. I will be checking out all the cute things in her shop. Please enter me into the drawing. I love the one you purchased, but they are all really cute. Have a great week and I am so ready for FALL. It's been to hot here in So CA and we are having another heat wave today. Love your pillow! And the giveaway one is too, too cute! Thank you for the chance to win! Etsy is like going to the worlds biggest craft show but with a/c and no sore feet! Her stuff is precious! Cute pillow!!! This is a really nice giveaway and I think I'll run on over there and use the coupon too! I LOOOOVE these Stacey. Ironically, my friend Michelle is sewing pillows for me to paint right now. This inspires me....I'm certain mine won't look as good as these but I'll give it a shot! Thanks for sharing Kay's wonderful talents with us! I'm so ready for fall! 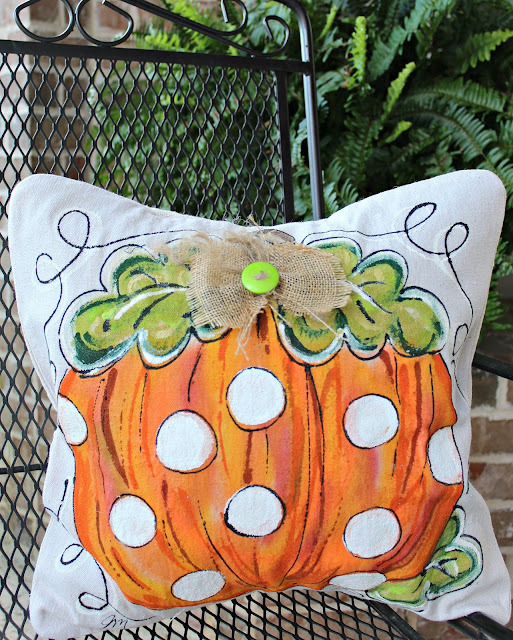 What a cheerful fall pillow yours is! Each design is so sweet. You made me laugh with your channeling cool winds and pumpkin spice comment, Stacey. I can so relate to that. I will channel along with you. Your pillow and all of the others are adorable. They look so happy and cheerful. I am fairly new to ordering from Etsy, but I love the thought of supporting small American made businesses. I will be checking out her shop next. Thanks so much for the giveaway. I'd love the chance to enter. It's darling. I love the one with the black ground. So, so cute. This pillow is so cute, Stacey! All of her pillows are adorable. I could certainly use one outside on the back porch! Ooh I love the pillow, Stacey!! It has such a whimsical, fun design. I'm thinking that it would be so cute on my patio, or on my sofa. Thank you for the opportunity to win this wonderful giveaway. I can see why it makes you smile Stacey. So darn cute! Thanks to Kay for her talent and for giving us a chance to win one. So cute! I will definitely be looking up Sipping Iced Tea!!! Thanks for sharing! Darling pillow. I love the items in her shop as well. I am a pumpkin fanatic so would LOVE to win. What adorable pillows. I have a pillow addiction and always find places for 'new' ones. Her Etsy store is full of great finds. Thank you for sharing 'Sipping Iced Tea' and for the lovely giveaway. 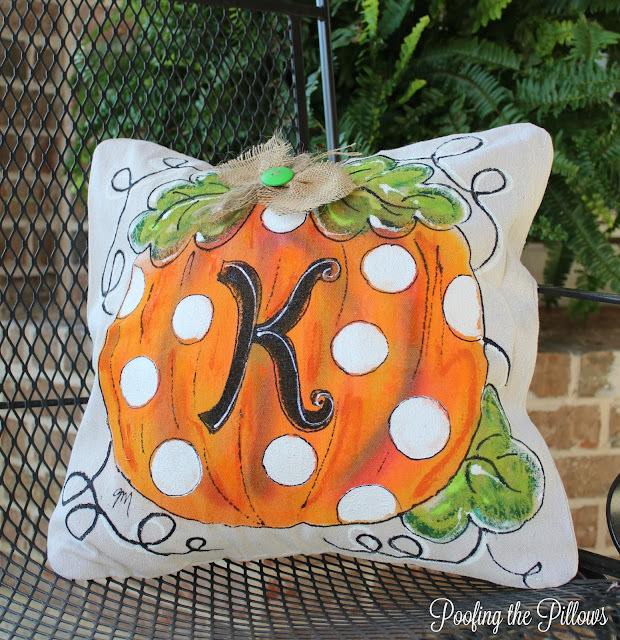 Love Love Love this pillow and need one on my patio too! I just love these pillows! They are so beautiful, and I'd love to display one in my home! I am off to check her store right now. Thank you for a chance to win. Beautiful pillow! Very cute pillow and if the giveaway hasn't closed, please add me in! I'm not quite ready for fall decorating but give me a week or two and I'll be jumping in as well. Off to visit Kay's site! So cute Stacey! 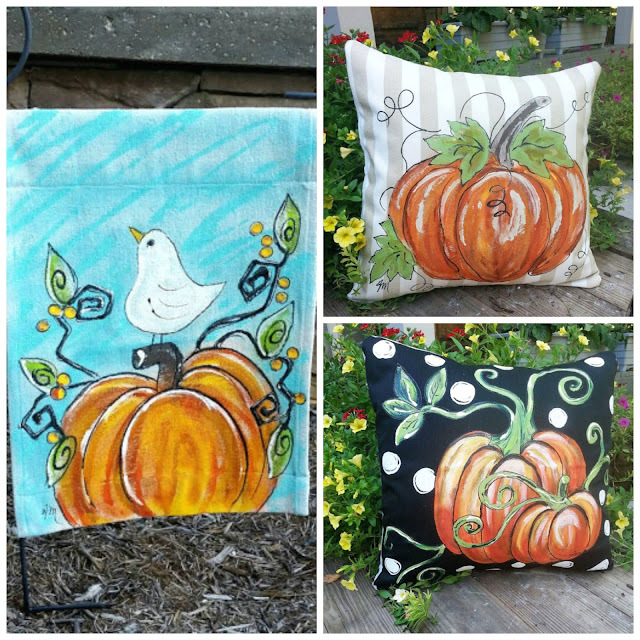 I just got some plain pillow covers to paint my own pumpkin pillows, I hope they turn out as cute as these! Of course I would love to win one, how nice of her to give you one for a giveaway! These pillow covers are too cute for words! Thanks for introducing such a talented crafter/artist. These pillows are just adorable. Kay has a lot of talent. I am heading over to her Etsy to check these out. Thanks for the chance at one of these beauties. Have a good week Stacey. Absolutely adorable! What a delightful way to welcome in the new season...thank you for an opportunity to throw my hat in the ring! Pillows are my fav! Love the fall! Very cute! Love all the pillows on the Etsy site - thanks for the giveaway! Fall is my favorite season to decorate for! What a great addiction to my fall decor. What cute pillows! I am going to check out Sipping Iced Tea! Stacey, these are all adorable! We're actually at our cottage for a couple of weeks while it remains unusually hot and humid. Hopefully when we return home, it will start to feel like fall and I can put out all our autumn and Halloween decor. I immediately went to her site when I saw the first pumpkin pillow. I LOVE her hand painted things....so sweet and well done. I would love a chance to win this cute pillow she is offering. What a cute pillow and it does make you smile. Such a great giveaway promotion too. Love this pillow! She's obviously extremely talented ~ thanks so much for telling us about her shop! I can't wait to check it out. :) I fully agree about supporting our friends! Just found your blog love it!Love the pillow so cute. Too cute!! I love decorating my home for fall. This lovely pillow would be a perfect addition to my fall decorations! It would give me such joy to see it every day!